Photo courtesy of Shanghai Electric Wind Power. LM Wind Power's first two sets of LM 66.6 blades have been successfully installed on Shanghai Electric Wind Power's 4.0MW-136 wind turbine in China. Shanghai Electric Wind Power's 4MW platform is designated for Windclass II areas in Shanghai and beyond. LM Wind Power provided onsite support and service to carry out the installation of the LM 66.6 blades at the Shanghai Lingang Phase I site. The installation of the 66.6-meter offshore blades on September 6, 2018 follows the signing of LM Wind Power's first deal with the leading offshore wind turbine manufacturer, Shanghai Electric Wind Power. In the two-year agreement, LM Wind Power's blade plant in Qinhuangdao will deliver the LM 66.6 blade sets during 2018 and 2019. 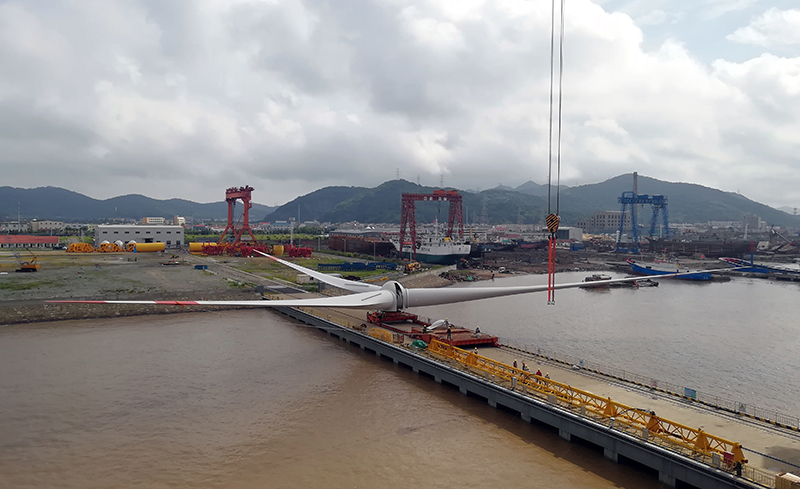 Shanghai Electric Wind Power Sourcing Director, David Chen, said: "LM Wind Power's proven offshore track record of quality and reliability was decisive in the selection of these long, advanced blades for our 4MW turbine. This will strengthen our offer to our customers in Windclass II projects." LM Wind Power's Vice President, Offshore, Alexis Crama, added: "This deal is a significant milestone for LM Wind Power to expand in China's growing offshore market. We are proud to have earned the trust of Shanghai Electric Wind Power, a reliable and accountable partner that has demonstrated its leadership in the Chinese offshore market. We look forward to supporting Shanghai Electric Wind Power and their customers in the coming years to further develop the offshore market and support China's green energy needs."